The South African Microbiome Initiative in Neuroscience was started by Dr Malan-Müller, Professor Hemmings and Professor Seedat, from the Department of Psychiatry, Stellenbosch University. Malan-Müller and Hemmings are molecular biologists from the neuropsychiatric genetics research group and work closely with Professor Seedat, who is the head of the Department of Psychiatry. The South African National Research Foundation and the Department of Science and Technology contribute to their research funding. Humans have trillions of bacteria living within and on us. They perform important functions to maintain our health, such as metabolising food and medicine and fighting infections. The gastrointestinal tract harbours the majority of these bacteria, which we refer to as the bacterial gut microbiota. Scientists use genetic analyses of these bacteria, to investigate the gut microbiome (genomes of the bacterial microbiota). The gut microbiota is extremely complex, and scientists are constantly uncovering new functions of these microbes and their association with disease. The South African Microbiome Initiative in Neuroscience aims to unravel the intricate connections between the gut microbiome and the brain. We will investigate this on a large scale in the general population by collecting stool samples as well as extensive data on demographics, lifestyle, health, neurocognition, stress, anxiety and trauma from consenting, adult participants. The human interactome encompasses the gut microbiome; its genes, proteins, and metabolites; and host factors and external environmental factors that concomitantly shape the microbiome and influence health and disease. The MGB axis contains pathways through which the microbiota influences the CNS, cognition, and mood. Furthermore, microbially produced proteins and metabolites can influence the host stress response system, CNS functioning, and the host epigenome and transcriptome. 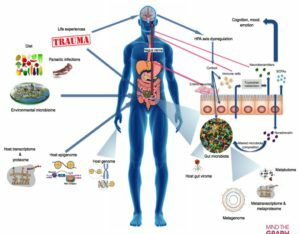 Traumatic experiences and stress can also alter the gut microbiota via HPA axis dysregulation and subsequent release of stress hormones or neurotransmitters that influence gut physiology, microbiota habitat, and composition and bacterial gene expression. CNS, central nervous system; HPA, hypothalamic–pituitary–adrenal; MGB, microbiota–gut–brain.